Hachioji station is known as the entrance of Hachioji city the center of the Tama area in Tokyo. 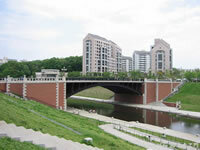 There is a big downtown in the north area of the station. 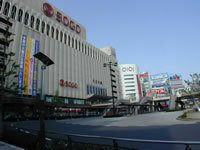 The building of the station includes Sogo department store. Buildings and facilities such as Yodobashi and Hachioji Hot Spring are attracting people. The festival, held in August, is a traditional festival. The brave parade of portable shrines and the carving of the float are remarkable. Eleven of the floats are the cultural properties of Hachioji city. You may feel the atmosphere of Hachioji's traditon. There will be approximately three hundred booths in the event.